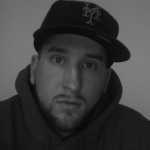 Joe Paterno passed away over the weekend. And to honor him, Penn State University will be holding "A Memorial For Joe," a public service for him, at the Bryce-Jordan Arena on the PSU campus on Thursday. As you&apos;d probably expect, though, there are a lot of Nittany Lions out there who are having trouble getting tickets for the event. So one ticket holder who got his hands on a pair of tix decided to do what any money-grubbing person with an entrepreneurial spirit would do: He put his "A Memorial For Joe" tickets up for sale on eBay. And in no time at all, the price shot up to $99,509—before eBay ultimately made the decision to cancel the auction and pull the post from their site. A lot of the bids that were placed were likely fake. 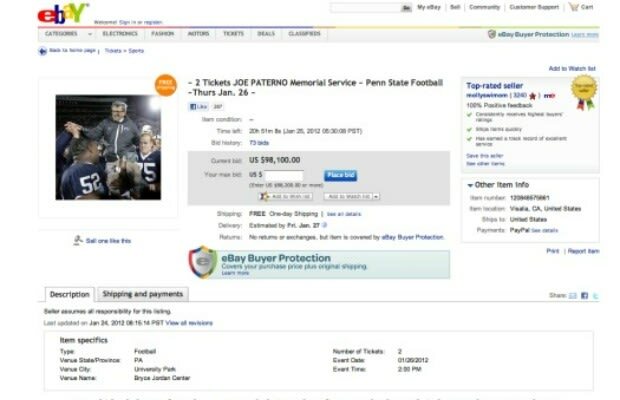 Some people are even suggesting that the PSU faithful drove the price of the auction up to force eBay to cancel it. But, doesn&apos;t this entire story just feel so...wrong? Like, we&apos;re really at the point where we&apos;re buying and selling tickets to a dead man&apos;s memorial service? At any rate, if you can&apos;t get tix to the memorial, you can always watch it live on the Big Ten Network on Thursday afternoon. And that sure beats paying 100 large for a pair of tickets, right?